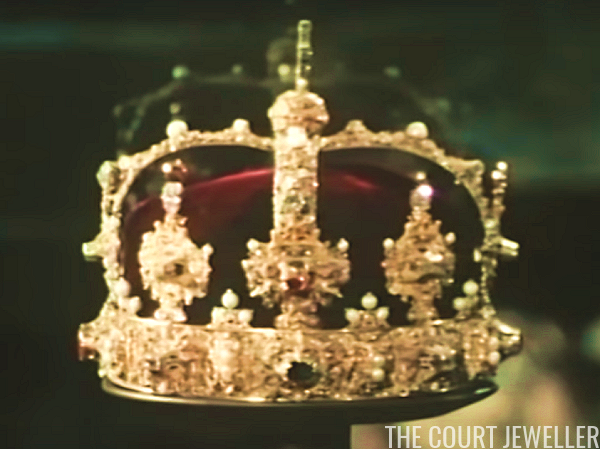 The final installment of our month-long look at crown jewels of Europe glittering in motion focuses on a grand Scandinavian crown that is no longer worn: the crown of King Eric XIV of Sweden. The crown, which was made in 1561 by Cornelius ver Weiden for the coronation of King Eric XIV, is the official crown of the King of Sweden. The elaborate gold crown is a typical example of Renaissance crown jewels of the time. King Eric XIV was a member of the Vasa dynasty. He was a contemporary of Queen Elizabeth I of England and Mary, Queen of Scots (both of whom he tried to marry). His reign, however, was a short one; he was deposed less than a decade after his accession to the throne. Subsequent Vasa monarchs used his crown, and it's clearly visible in the coronation portrait of his nephew, King Sigismund. The Vasa dynasty's rule in Sweden ended in 1654 with the abdication of Queen Christina, and monarchs from the subsesquent dynasties of Palatinate-Zweibrücken, Hesse, and Holstein-Gottorp chose to be crowned with a different crown that had been made for Christina. Eric XIV's crown wasn't used again until 1818, when it was selected for the coronation of the first Bernadotte monarch, King Carl XIV Johan. In the early twentieth century, these changes were reversed, and the crown was restored to closely resemble is original Renaissance appearance. Today, it resides in the treasury at the Royal Palace in Stockholm along with the rest of Sweden's royal regalia, which includes numerous other crowns and coronets. The last Swedish king to wear the crown was Oscar II; he was also the last Swedish king to have a coronation. (The crown was remodeled after his reign, so you can see the diamond rosettes and elaborate monde and cross in the image above.) 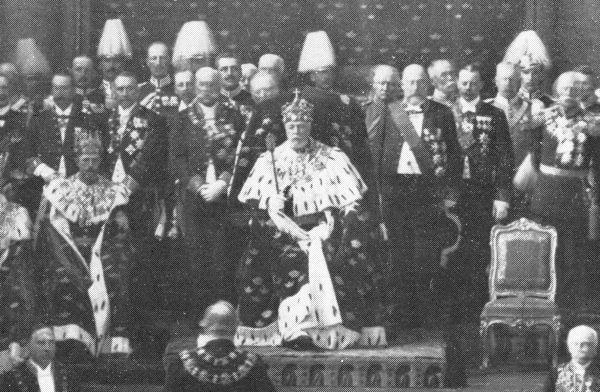 Since his death in 1907, the crown has been displayed at important events, but it is no longer worn. The royal treasury functions as a public museum, so even though we will likely never see a Swedish monarch wear a crown again, we can still see and enjoy the royal regalia.